This weekend during 'HooptieCon' at Sonoma Raceway, I was given the opportunity to sit in the passenger seat of a gorgeous 4,700 mile Porsche 959 as it circulated a paced parade lap. You wouldn't normally expect to see Porsche's pinnacle of 1980s engineering excellence participate in an event called HooptieCon, but this is a truly special event. You see, HooptieCon is billed as Comic Con for cars, a combination of several automotive themed events happening at the same time at the same place. The 24 Hours of Lemons runs a spring race at Sonoma Raceway every year, and this time they wanted to try to get more people through the entrance as spectators. In order to do that, and to give the attendees more things to do outside of watching the race, they invited a handful of car shows to host their shows at the track, including Lemons adjacent shows like Concours d'Lemons, and a smattering of Lemons Rally participants, but other tangentially-related shows like Billetproof Hot Rods, The Gambler 500, and Radwood were in attendance. We've covered Radwood here before, and before we go any further, it's worth mentioning that I'm one of the co-founders of the show. Radwood celebrates the cars and culture of the 1980s and 1990s, and has been incredibly well received since it kicked off. This was our third show in 10 months, and there was an incredible turnout for what some might have considered a Lemons sideshow. Over 250 cars pre-registered for the show, and one of those cars was this incredible 959 from Canepa Motorsport in Scotts Valley, CA. 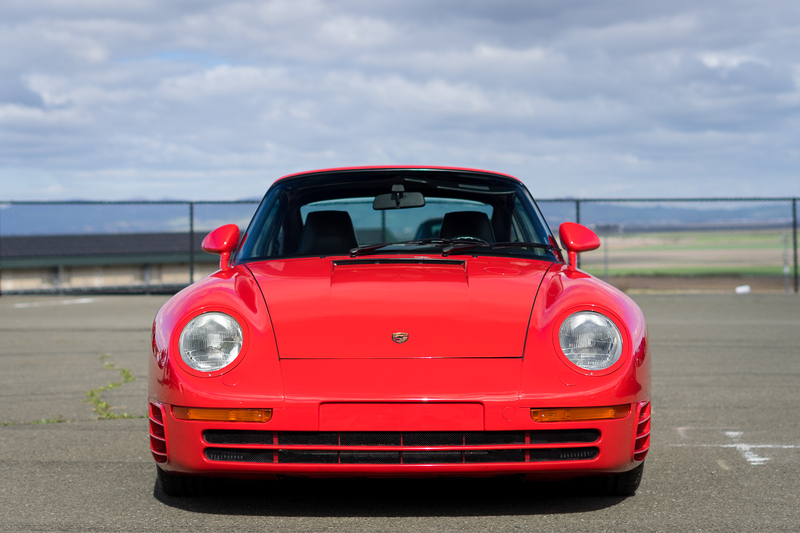 This 959 is an original California-legal Canepa stage 1 modified Porsche, and with very few miles on the clock, it's still in near-perfect condition. Back in 2001, this 959 was modified with non-sequential twin-turbochargers, a different exhaust, and a more modern ECU to make 576 horsepower (up from 450), not to mention pass a smog test with flying colors. The suspension was also upgraded to 959S specification, ridding the car of its hydraulically-adjustable height. The 959 was trailered up to Radwood by Canepa's marketing man Zach. He was around the car all day to answer questions, and gave a few groups of fans the opportunity to hear the Porsche start up and rev a little. He was protective of the car, for obvious reasons, but represented it well and probably earned it a few new young fans. Many of the attendees had never seen one of these beasts in person before. While I was honored simply to see one of Porsche's most incredible cars attend our weird '80s and '90s car show, I was completely blown away when they agreed to stick around until the end of the day for the parade laps. Not only that, but they wanted to be the lead car in the parade lap pack of over a hundred cars. We jumped at the chance to accommodate this request, and we set up Matt Farah's press loaner Mercedes AMG wagon in front with a photographer hanging out the hatch in order to get some on-track once-in-a-lifetime shots of the 959. As the close of the day approached, I asked Zach if he wouldn't mind if I joined him in the passenger seat for the parade laps. 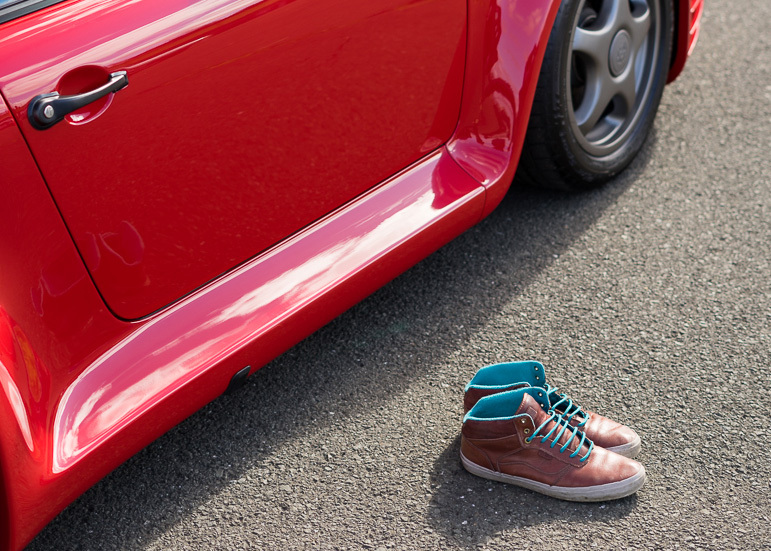 Before he could respond, I added that I'd happily take off my shoes for the opportunity, knowing the 959 was low mile and that he and Bruce Canepa would appreciate the extra step to keep the car clean. The inside of this car was perhaps even more perfect than the outside. This was my first time inside such a special car, and while I am familiar with what a 959 looks like inside, it's still something of a startling experience to see just how familiar it is to anyone who has ever driven a standard 911. From the dashboard and door panels to the seats and window openings, everything inside the 959 is reminiscent of a 911 Carrera 3.2. Once the Lemons race ended, we rolled the 959 onto the racing surface. The track's safety truck led the way, the photography car ran right behind that, then Zach and I in the 959. The line of cars filtered in behind us. Zach had a hard job to do on the lap. He'd never been on track at Sonoma before, and wasn't intimately familiar with the 'racing line'. Furthermore, he had to keep the 959 far enough away from the camera car ahead (which, being an AMG wagon, was fitted with wide and sticky tires) to avoid getting hit by any tire pickup, and close enough to the camera car that the photographer could produce good images. Sonoma is a gorgeous track with gentle rolling hills surrounding the ribbon of asphalt. Lemons had been running a race all day, featuring over 100 racers on course at the same time, but the track workers had done a commendable job of clearing the track of debris. Compared to many tracks I've driven before, Sonoma is a nice smooth racing surface that appears to have plenty or room to race. Admittedly, we were moving at only a fraction of the 959s capabilities, but it was still a decent clip. The truck ahead of Matt's camera car was moving quite quickly, too, and gave us plenty of room to use the throttle liberally. It was a great, if quick, on-track photo shoot, and I am glad to have been a part of it. With a desire to keep the miles low, we restricted our journey to just a single lap while everyone else continued on the track. As we peeled off the track, our quick jaunt was over and done with as quickly as it had started. This was an experience I may never have again, and I'm extra grateful to Canepa and Zach for the opportunity. They were incredibly gracious hosts while I was aboard the good ship 959. It's an incredibly advanced Porsche that has aged remarkably well. According to the Canepa website, they're working on a very special 959-related project. We'll get to see it at #LuftV next month, so look for an up close feature of that shortly. The Porsche 959 has been my favorite since I read about it in Road & Track in the 80’s. I’ve never had the chance to see one in person. Someday I hope to see one! Great car, shame that everyone is so obsessed by mileage that they can’t use it.